Good evening! Today is day 2 of Digital Dozen 'Get To Know Me' and this time I decided to go a bit deep and I am sorry if it makes anyone uncomfortable but this is something I am very open about and bringing it to attention is important to me because it helps bring awareness to it. For those of you who don't already know, I suffer from a Generalized Anxiety Disorder, Depression and Obsessive Compulsive Disorder. Every single day of my life I struggle to do the most basic of things that most people take for granted. I have excessive and unreasonable fear over things that most can usually just shrug off or don't even give a second thought of. I live in a constant state of fight or flight and it takes a beating on my body. Fortunately, It does not control me as much as it used to(I have been battling this for over 15 years) but it still plays a very large role in my life. I get help and I am surrounded by an amazing support system of family and friends who never make me feel any different then they are. I have learned to accept that all of these things are illnesses and it is not something I can control or get over. My brain is just wired differently then others. I am not crazy. I am not weak. and I am not defined by my illness. I hope me writing this post will bring awareness to Mental Illness, and that non of you lovelies look at me differently because it. I am still the Cheyenne you all have come to know and all of your love towards me is part of my support system and I just wanted you to all know that, so thank you! Generalized anxiety disorder (or GAD) is characterized by excessive, exaggerated anxiety and worry about everyday life events with no obvious reasons for worry. People with symptoms of generalized anxiety disorder tend to always expect disaster and can't stop worrying about health, money, family, work, or school. Obsessive Compulsive Disorder (OCD) is a mental health disorder that affects people of all ages and walks of life, and occurs when a person gets caught in a cycle of obsessions and compulsions. Obsessions are unwanted, intrusive thoughts, images or urges that trigger intensely distressing feelings. Depression is a common and serious medical illness that negatively affects how you feel, the way you think and how you act. Fortunately, it is also treatable. Depression causes feelings of sadness and/or a loss of interest in activities once enjoyed. It can lead to a variety of emotional and physical problems and can decrease a person’s ability to function at work and at home. If you or anyone you know suffers from Mental Health Illnesses and you or they need help please contact https://www.mentalhealth.gov/get-help/immediate-help/. I'm always glad to know more about my favorite nail artists -- the good, the bad, and the real. ;) Thanks for sharing! I too have a chronic condition (albeit a physical one, but depression is an inevitable by product) and I'm thankful for your reminder that it doesn't define us. It is always reassuring when our friends/family accept our situation and don't put pressure to "feel better" or "over it" (intentionally or not), I'm so glad you have a strong support and loving people around you (I do too luckily). Your strength is inspirational. 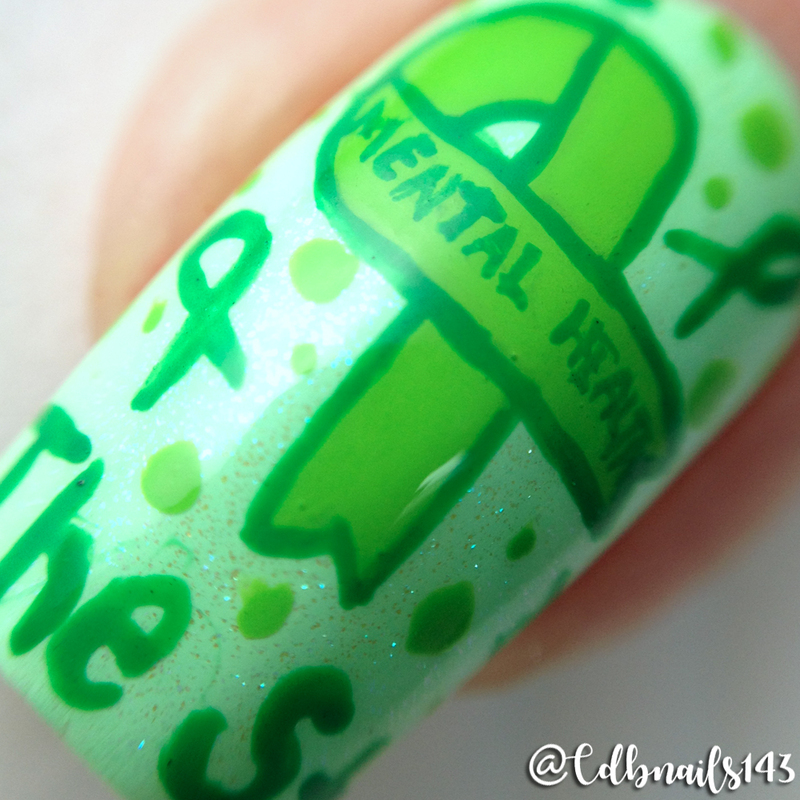 And, of course, your nail art is intriguing as always!! All that lettering looks like it took awhile! I'm awed by your bravery of topics...and in tackling those fonts. Cheers Hun, luv you as always. Sending you loves and positive vibes! Love that you are so open about these topics. I've always loved how open you are about your battle with these illnesses. 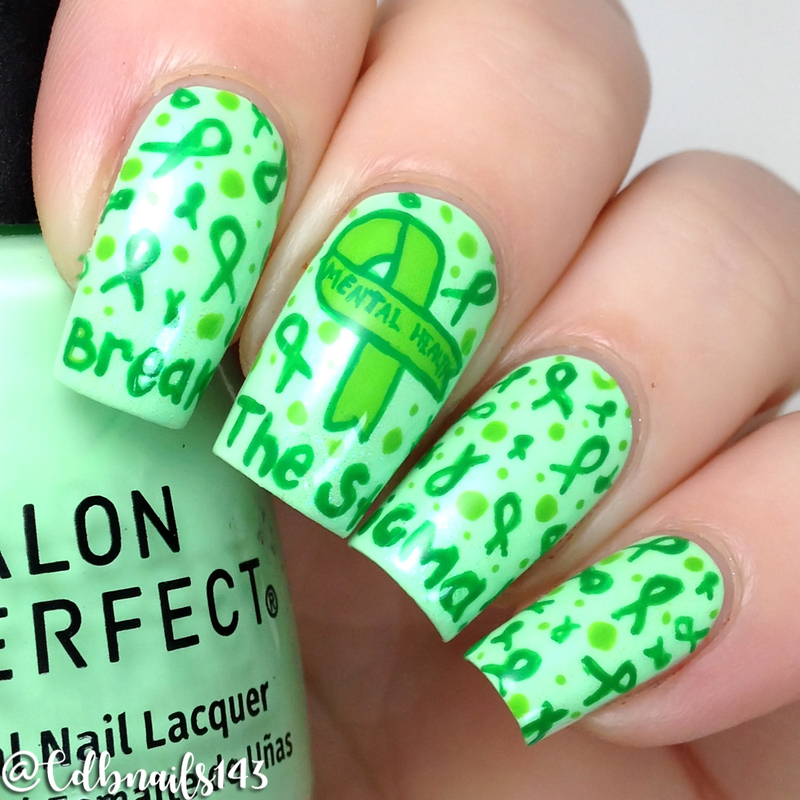 You truly are an inspiration when it comes to these topics (and nail art<3). Keep your head up!